Wow, there’s a spectacular display of hypocrisy. Selby’s knew very well there was no way the orchid could have been brought in to the U.S. legally, thanks to the convoluted logic of CITES regulations. In their rush to get their names consigned to posterity, they forgot to cover their posteriors. SARASOTA — A Virginia nursery owner who brought a rare orchid to the Marie Selby Botanical Gardens has been indicted by a federal grand jury on charges of smuggling the plant into the country. 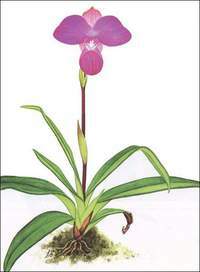 The grand jury in Tampa last week indicted James Michael Kovach on charges of smuggling and illegally possessing a rare Peruvian orchid now named for him: Phragmipedium kovachii. Kovach, 48, has not been taken into custody. If convicted of the felony charge of smuggling and the misdemeanor charge of possession he will face up to six years in prison and fines of up to $350,000. The feds are also in negotiation with Selby’s board of trustees over the garden’s punishment for accepting the orchid in June 2002, and then naming it a week later. Barbara Hansen, chairwoman of the board, said Thursday that Kovach’s indictment clears the non-profit research center along U.S. 41 of most of the blame in the matter. “I think that pretty well proves that the garden is quite innocent of any wrongdoing except in accepting the orchid to identify it,” Hansen said. The indictment is the latest in a string of challenges facing Selby. Several key staffers have quit in recent months including Shawn Farr, the man hired in May to stabilize the gardens. Farr cited disagreements with Hansen and other board members. Lowman, Selby’s popular director since 1999. Former board member Bob Richardson has also asked local and state officials to look into the current board’s handling of the gardens’ affairs and whether there are enough trustees left to legally run the place. In the orchid world, Kovach’s orchid has been described as the most spectacular find in 100 years. Federal investigators have charged that Kovach brought the orchid into the United States in violation of the 1973 Convention on International Trade in Endangered Species treaty. The treaty is intended to keep threatened plants and animals from being spirited out of the wild. Kovach found the flower in May 2002 while on an orchid-collecting trip in Moyobamba, a city in the high jungles of northeastern Peru. Kovach’s discovery wasn’t the result of years of hunting; he bought the plant in a pot from a roadside flower stand. Moyobamba, population 95,000, capital of the sprawling San Martín province, is also known as “The Orchid City” because of its abundance of flowers and its thriving orchid trade. big as any “lady slipper” orchid anyone had ever seen. Kovach flew back to the States and went through U.S. Customs in Miami. He declared he had plants and was whisked through. Kovach headed straight for Selby, where, on June 5, he met with Dr. Wesley E. Higgins, head of the orchid identification center, and Dr. John T. Atwood, then Selby’s orchid curator. Higgins still works at the gardens, but Atwood left last year. It’s unclear what, if any, paperwork was produced when Kovach showed up. Lowman told the Herald-Tribune last year that Kovach produced the proper paperwork upon his arrival and that “we would have kicked him out” if he didn’t have it. Lowman also said that Selby does not check or verify papers. law enforcement work for which Selby is ill-suited. Orchid growing is big business. According to the U.S. Department of Agriculture, there are more than 700 orchid growers in the United States with sales topping $100 million annually. plant nomenclature, the first to publish a description of a species gets to name it. Selby, after a marathon session of writing, research, description and peer review via Internet, published a brief description in a special handout on June 10, 2002. The handout’s tiny circulation didn’t meet accepted standards for publication, though. Two days later, just a week after Kovach dropped off the flower, Selby published its description in a special edition of its journal “Selbyana,” which did meet the requirements. A woman who answered the phone Thursday at Kovach’s home in Goldvein, Va., declined to comment and hung up. Selby’s light-speed naming of the orchid beat out Eric A. Christenson, a former Selby taxonomist who was working to name the same plant. Christenson said Thursday that he feels that Selby got caught up in a trend in the orchid community of playing loose with the rules. involvement in smuggling a high-profile orchid into the country.